After an overlap period for a smooth transition, the 2019 individual nature fees and entry prices for Bonaire’s national parks are now effective as from the first of March. 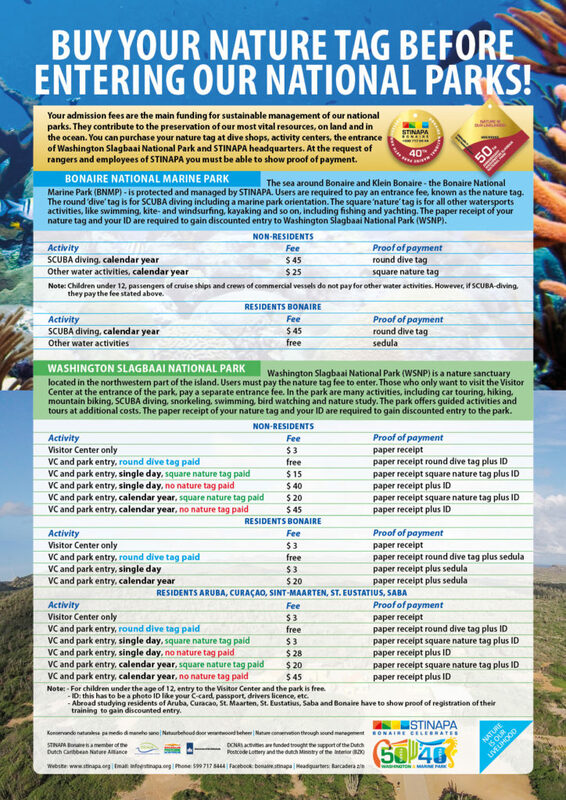 For users of Bonaire National Marine Park (BNMP) the round dive tag fee is $ 45 and the square nature fee $ 25 per calendar year. The entrance fees for the two national parks are the main funding for sustainable management and protection of Bonaire’s nature treasures, on land and in the sea. Therefore, the purchase of the round dive tag (SCUBA diving) and square nature tag (all other water activities) is required by law: Island Resolution Marine Park 2010 paragraph II article 2. The high nature values of our island are not only our natural, but also our economic capital. Visitors from all over the world come to Bonaire for its unique and varied nature. STINAPA works for the best possible nature experience. With the raise in tariffs, STINAPA will be enabled to considerably extend its key services.